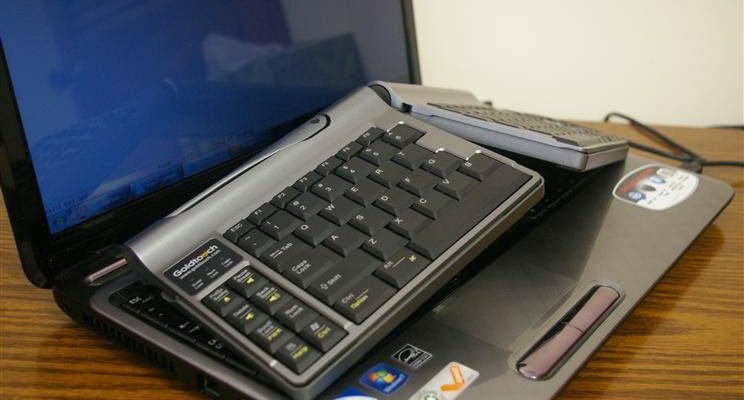 While there are many different ergonomic keyboards on the market, hardly any are suited to portable use. Standard curvy models like the MS 4000 are too big to fit in a laptop bag (though that doesn’t keep some people from trying). 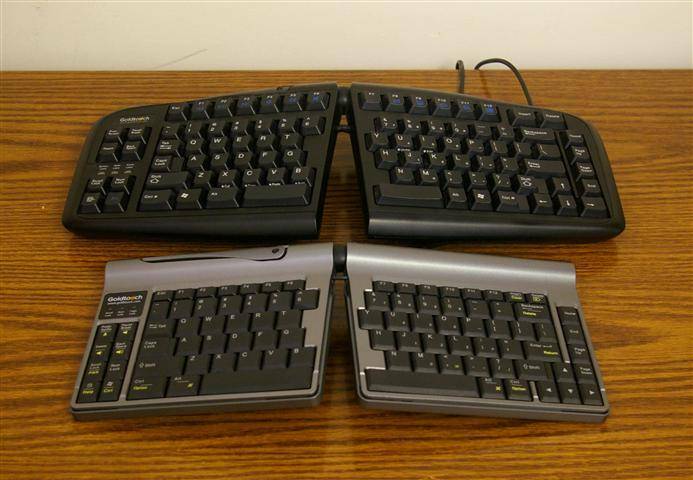 The Kinesis Freestyle is compact enough, but its multiple pieces make for an awkward carry. 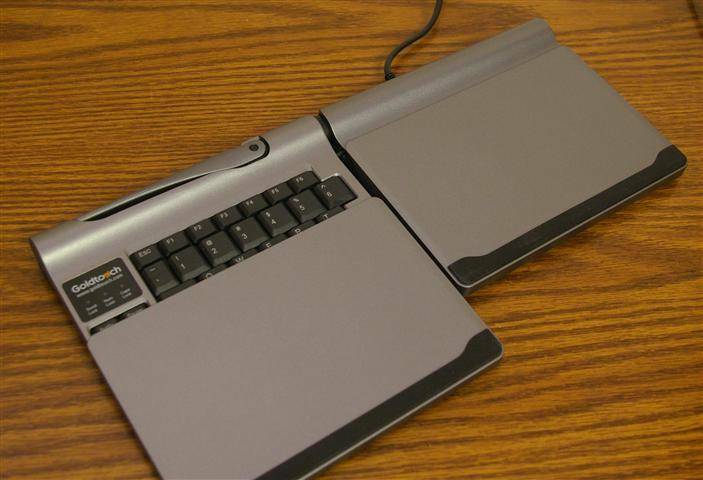 Also, these keyboards can only sit in front of your laptop on a desk, not straddle it. Are airline passengers and park-bench poets simply doomed to a life of poor ergonomics? Only if they’ve never heard of the Goldtouch Go, a miniaturized and highly portable version of the Goldtouch ergonomic keyboard can that actually straddle your laptop. 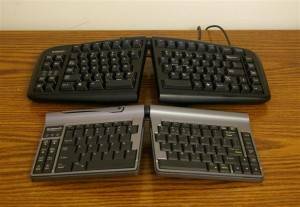 In case you’ve just joined us here on the Ergonomic Channel, the main purpose of most ergonomic keyboards is to straighten out your wrists and open up your arms. Different designs encourage this “natural” typing posture in various ways. 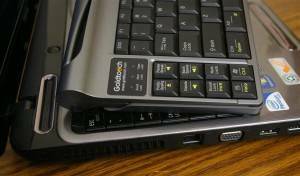 The Goldtouch permutation involves a split keyboard with a ball joint in the middle. This system offers an insane variety of possible splay, tent, and tilt combinations. If you’re still not clear on how this works from the pictures, hop over to my Goldtouch review and read up. The Go works exactly like a smaller version of its older sibling. 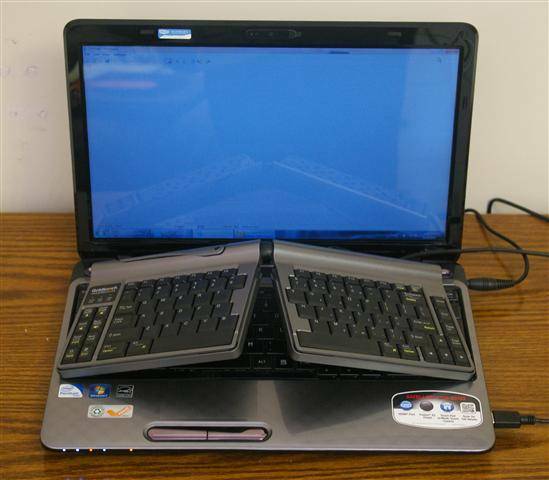 When I first tried to fit the Go on top of my laptop keyboard – like all the pictures show – my reaction was a grunt of disappointment and disgust. Even though my Toshiba laptop is only a 15.6″ model, it has an extra-wide keyboard with a dedicated number pad. Thus, it looked obvious that the Go had no possible footprint to avoid mashing down on the built-in keyboard while typing. I started mentally concocting a scheme to spread out the load using a yellow legal pad as a sort of table. I was just setting it up – and congratulating myself for my ingenuity – when it occurred to me that my newly-invented kludge was completely unnecessary. 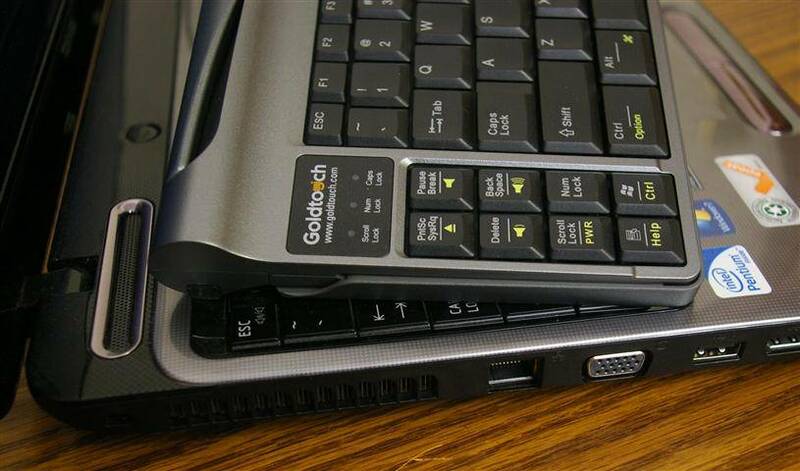 The Goldtouch Go handily spans my laptop keyboard so that no keys are accidentally pressed. As it turns out, the Goldtouch engineers should be given credit for some intelligence (unlike me, apparently). 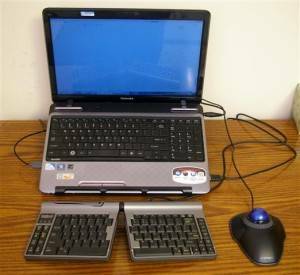 They realize that certain laptop keyboards are wide, and they address this problem by spanning the built-in keyboard the other way. Instead of trying to reach all the way from the left edge to the right, the Go spans the depth of the keyboard. You may have to feel around a bit for the correct position on your particular notebook, but those four contact points are far enough apart to find four steady rests, clear of all the built-in keys. Setting up the Goldtouch Go is something you’ll be doing a lot if you use it in a mobile context. Step one is to take off the plastic covers by pressing down on the sticker-indicated spots and sliding. Once the covers are off the top, flip and slip them onto the bottom. This keeps them with the keyboard so they don’t get mistaken for drink coasters and left in the coffee shop. Just as importantly, you’ll need those non-slip rubber strips between the keyboard and your work surface. The Go is picture here set up for use in your lap. To make your adjustment, open the handle and put the keyboard in the desired operating position, then snap the handle shut to lock it. It’s best to do this on a flat surface to ensure that the feet are level with one another. 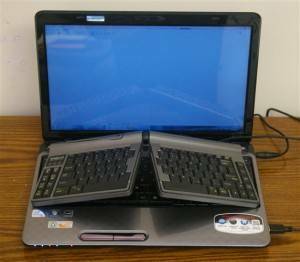 In a pinch, the top of your laptop should work. Just don’t try to make the adjustment in mid-air, or on a non-flat surface such as your lap. 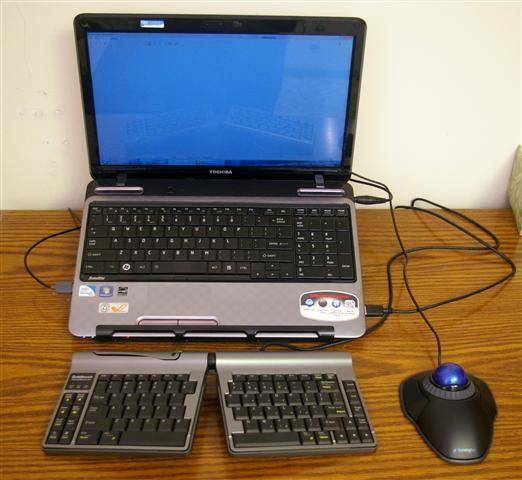 Here’s a fairly ergonomic laptop setup – note the laptop riser and external trackball together with the Goldtouch Go. Speaking of your lap, I should mention that your thighs do not form an ideally ergonomic work surface. When the laptop is that low, the screen angle encourages you to tuck your chin – a posture that’s great for boxers, but tends to give everyone else iPad Neck. If a desk or table is available wherever you’re working, it’s generally best to use it. Just be sure to throw a good mouse or trackball in the bag, and if possible, a laptop riser as well. The key covers protect the Go during travel – and contain the codes for toggling Mac mode. Unlike the Goldtouch, which features the most wonderful low-force keys, the Go has two panels of boringly ordinary laptop-grade buttons. The main keys are standard size, but many of the edge ones have been narrowed or squashed to accommodate the smaller footprint. There are no media keys, unless you’re on a Mac. In case you are on a Mac, the Go ships with dual legends for Redmond and Cupertino. The key combinations to switch back and forth are labeled inside one of the covers, which is another great reason not to lose those. My brother is a full-time user of the Goldtouch. After I had him try the Go for a few hours, he remarked that he might actually prefer it for his main office keyboard. Why? Because the smaller size would leave more space for a standalone numeric keypad, something he has missed ever since switching to an ergo board. The Go is significantly smaller, and thinner, than the senior Goldtouch. This brings up an unadvertised attribute of the Go keyboard: Its small size is good for more than just mobile. It can also save plenty of room on your very immobile desk. Minimalism and ergonomics are sometimes enemies (see tiny mice and trackballs) but other times they’re wary friends. A small keyboard like the Go can help keep other things – like your mouse, graphics tablet, or phone – within easy reach in a crowded world. Just as with the senior Goldtouch, that snapping turtle of a handle should be treated with respect. There’s the obvious danger of getting your fingers painfully pinched, but you’ll also need to keep the backswing away from your fragile laptop display. Oh, and one more thing: If you’re fighting a deadline on the red-eye to New York, be sure to set up the keyboard before the other passengers have settled in for the night. The Go’s typing action is quiet enough, but the adjustment handle snapping into position sounds roughly like a mousetrap going off. My recommendation: “Go” for it. Being relatively hard to please, I tend to have a gripe or two with each product I review. The Go has some room for improvement, I’m sure – but nothing obvious enough to bother me during the time I tested it. If I were among the many road warriors circling the country these days, I would consider this compact and ergo-friendly keyboard an essential part of my mobile arsenal. Disclosure: This review was made using a complimentary sample from Keyovation.